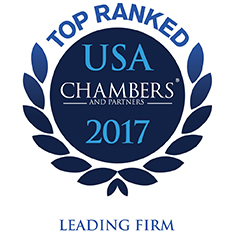 (CHICAGO) Katten Muchin Rosenman LLP today announced that 59 attorneys along with 26 of the firm's practices have been recognized as industry leaders in the 2017 edition of Chambers USA: America's Leading Lawyers for Business. Katten's highest rankings are in the categories of Real Estate and Real Estate: Finance, and the firm received elevated or new rankings in Real Estate, Capital Markets: Derivatives and Real Estate: Mainly Corporate and Finance. Partners Michael R. Callahan (Healthcare), J. Hayden Harrell (Real Estate), Daniel S. Huffenus (Real Estate), Alvin Katz (Real Estate), Floyd A. Mandell (Intellectual Property) and Laura Keidan Martin (Healthcare) received the highest individual rankings possible in their respective practice areas. Katten was ranked in the following categories in the Chambers USA 2017 guide: Banking and Finance, Bankruptcy/Restructuring, Capital Markets: Derivatives, Capital Markets: Securitisation, Corporate/M&A and Private Equity, Environment, Healthcare, Intellectual Property, Investment Funds: Hedge Funds, Litigation: General Commercial, Litigation: White-Collar Crime and Government Investigations, Media and Entertainment: Litigation, Real Estate, Real Estate: Finance, Real Estate: Mainly Corporate and Finance, Sports Law, Startups and Emerging Companies, Tax, and Transportation: Aviation: Finance. The following Katten attorneys were individually recognized in the Chambers USA 2017 guide: Antitrust – Andrew G. Klevorn; Banking and Finance – Michael A. Jacobson, Glen K. Lim, and Stuart P. Shulruff; Bankruptcy/Restructuring – Craig A. Barbarosh, William B. Freeman, Kenneth J. Ottaviano, Peter A. Siddiqui and John P. Sieger; Capital Markets – Guy Dempsey (Derivatives), Christopher DiAngelo (Securitisation), Kevin M. Foley (Derivatives), Arthur W. Hahn (Derivatives) and Anna-Liza B. Harris (Securitisation); Construction – S. Scott Morrison; Corporate/M&A – Kenneth W. Miller (Private Equity), Jeffrey R. Patt, Herbert S. Wander, Walter S. Weinberg (Private Equity); Financial Services Regulation – Consumer Finance (Compliance and Litigation): Claudia Callaway; Environment – Lily N. Chinn, Mark L. Farley, Nancy J. Rich (Litigation), Steven P. Solow, and Danny G. Worrell; Healthcare – Michael R. Callahan (Healthcare, Healthcare: Regulatory and Litigation), W. Kenneth Davis, Jr., D. Louis Glaser, Laura Keidan Martin, Peter F. Nadel, and Joseph V. Willey; Intellectual Property – Floyd A. Mandell; Investment Funds: Hedge Funds – Henry Bregstein and Allison C. Yacker; Startups and Emerging Companies – Matthew S. Brown, Jeffrey R. Patt; Labor and Employment – Greg Dillard; Litigation – Brian F. Antweil (General Commercial), Scott A. Resnik (White-Collar Crime and Government Investigations), Gil M. Soffer (White-Collar Crime and Government Investigations), Bruce G. Vanyo (Securities), and Sheldon T. Zenner (White-Collar Crime and Government Investigations); Media and Entertainment – David Halberstadter (Litigation), Michael S. Hobel (Transactional), and Joel R. Weiner (Litigation); Real Estate – Frank E. Arado (Finance), David R. Dlugie, Wendy Fields, J. Hayden Harrell (Finance), Daniel S. Huffenus (Finance), Alvin Katz, Kenneth G. Lore, Seth R. Madorsky, and Mark C. Simon; Sports Law – Harris R. Eisenberg and Adam R. Klein; Tax – Sheldon I. Banoff and Saul E. Rudo; and Transportation Aviation: Finance – Thomas E. Healey and Timothy J. Lynes.